Discussion in 'Other Norton Motorcycles' started by 84ok, Sep 2, 2018.
awhile ago, started a thread - 'diff engines commando frame', turns out there have been a few including, yam xs650 twin, early honda cb750-4 (mighta been fb frame), triumph trident..
or before i go any further with possible fitting, haven't a clue if the stock kaw engine is workable with the isolastics? this woulda been my first choice ~ 80 horse, 5 valver, early ones are 360deg cranks, maybe down the road..
i've seen early cb750, xs650, prob others & pretty sure at one point there was a possibility (or looked into at least) of a factory effort, triumph trident engine fitted to a commando frame for sale, any info on how the isolastics were worked out in that engine combo? eitherway, have the bits now to see how the kaw motor may fit, when it gets warmer..
texasSlick and Hortons Norton like this. re; "they were advertised ~ 55 horse & picked one up with a good story complete for 100 bux ..pretty heavy lump"
yes, they were heavy, but bear in mind they are unit construction, which included gearbox, clutch. . . . . . . . . . The gearbox sprocket woukd be a long way from the swing arm pivot, thus leading to a very long drive chain & all the problems that brings. It would also look a bit lost in the Commando frame. 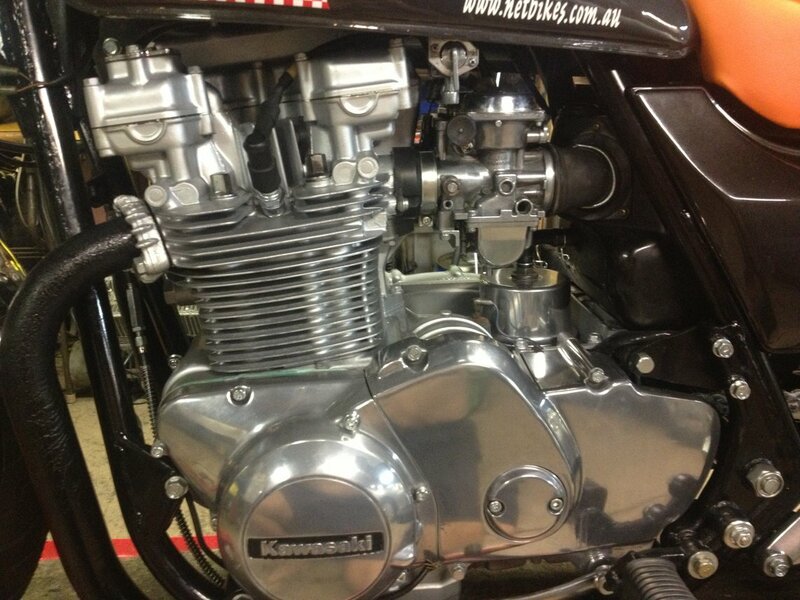 Does a Norton 961 engine fit the Commando frame? That would be a logical step forward. The rubber mounted cradle could be discarded and the winging arm support redesigned for a wider and stronger swinging arm. It doesn't leave much of the original Commando though. One might as well use a Metisse frame or any other lightweight frame designed to handle the increased torque as a starting point. But in racing did an atlas ever out perform a commando on the track? Or even a commando motor in a featherbed frame out perform a commando frame ? maybe wouldn't even be a yuuge deal with a sporster engine? or perhaps some other counterbalanced V twin? Are there 2 engine mounts at the front of this engine? I'd assume you would have to remove the engine to pull the head off but how often would you need to do that?